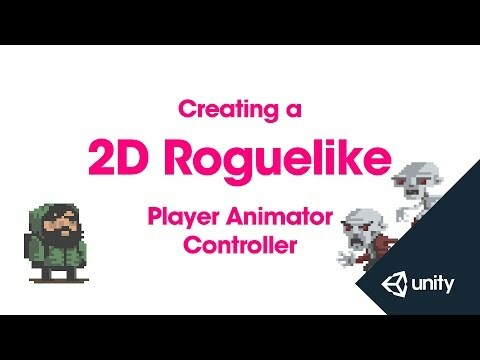 This is part 8 of 14 of the 2D Roguelike tutorial in which we set up the Player Animator Controller. is playing via a script. the player prefab back to the hierarchy. select the player and drag to the hierarchy. Next we're going to open our player animator controller. the PlayerHit will be over here. The PlayerIdle is orange because it's the default state. the player's idle animation is going to play. is attacked by an enemy. those animations from our scripts. and add a parameter of the type trigger. This first one is going to be called playerChop. immediately be reset after it's used in a transition. and then become false again. We're going to create another one called playerHit. Next we want to create some transitions between our states. and drag to our PlayerChop state. can then transition back to PlayerIdle. PlayerChop to make it visible in the inspector. is not going to have an exit time. We're going to uncheck Has Exit Time. regardless of where we are in the Idle animation. set the transition duration to 0.
when we're working with sprite-based animation. to cause this transition to happen. default is actually the condition that we want. and choose either PlayerChop or PlayerHit. transition from PlayerIdle to PlayerChop. We're also going to set the transition duration here to 0.
when the exit time is reached. Let's setup the same things for PlayerHit. and transition back to PlayerIdle. PlayerIdle animation whenever the player is hit. And we're going to set our transition duration again to 0.
and select PlayerHit from the drop down. For our transition back to PlayerIdle. and we're going to set the transition duration to 0. Before we move on we're going to give this a quick test. down here on the bottom of the screen. triggers and see what happens. And then we'll try PlayerHit. Excellent, so we can see that those are working. to writing the player script.